Actor, businessman, politician and bodybuilder who shot to worldwide fame with films Conan the Barbarian and Terminator film franchise. He then went on to appear in films such as Commando (1985), The Running Man (1987), Predator (1987), Twins (1988), Total Recall (1990), Kindergarten Cop (1990), and True Lies (1994). He served as the Governor of California from 2003 to 2011. Arnie, Austrian Oak, Conan the Republican, Styrian Oak, The Governator, The Running Man, Conan the Governor, The Machine. He holds dual citizenship of American and Austrian. He’s currently 71 years old. Arnold attended University of Wisconsin–Superior and later to Santa Monica College. Siblings – Meinhard Schwarzenegger (Older Brother) (Died in 1971. Arnold Schwarzenegger married journalist and author Maria Shriver on April 26, 1986 in Hyannis, Massachusetts. Together, they have four children – Katherine Eunice Schwarzenegger (born December 13, 1989), Christina Maria Aurelia Schwarzenegger (born July 23, 1991), Patrick Arnold Shriver Schwarzenegger (born September 18, 1993), and Christopher Sargent Shriver Schwarzenegger (born September 27, 1997). The couple ended their 25 years of marriage on May 9, 2011. Their divorce finalized in 2017, six years after separating. Prior to his marriage, Arnold dated Barbara Bakern, Kellie Everts, and Sue Moray. Post marriage, he was romantically linked up with stars including Eleanor Mondale, Debra Wrenn, Brigitte Nielsen, Rachel Ticotin, Gigi Goyette, Mildred Patricia Baena and Heather Milligan. Arnold Schwarzenegger made his acting debut in the 1970 film, Hercules in New York playing Hercules. He was credited as Arnold Strong in the film. He achieved enormous fame for his roles in acting packed films, Conan the Barbarian (1982), The Terminator film series, Commando (1985), The Running Man (1987), Predator (1987), Twins (1988), Total Recall (1990), Kindergarten Cop (1990), and True Lies (1994). Having served as the Governor of California for two consecutive terms from 2003 to 2011. He won the Mr. Universe title five times and the Mr. Olympia title seven times. Though out his career, Arnold has appeared in several television commercials including Mix-Power, ÖBB (Österreichische Bundesbahn), DirecTV, Energy drink, Hop’s beer, Nissin Cup Noodle, California Travel and Tourism Board, Diet 7Up, Bud Light beer, etc. 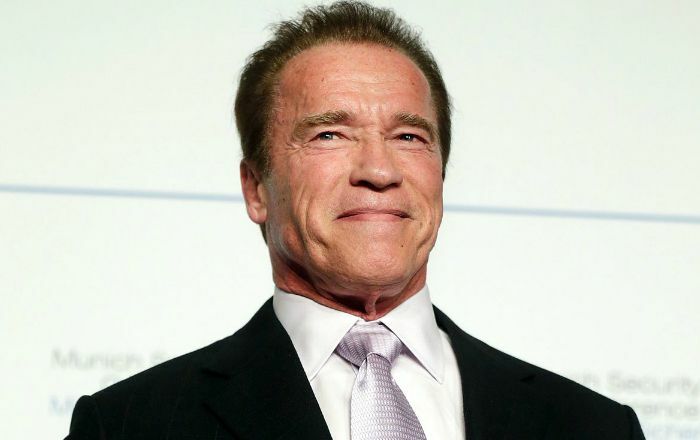 Schwarzenegger has an estimated net worth of $400 million US dollars as of 2018. Growing up he was very much interested in Soccer but later took bodybuilding at the age of 15, and began participating weightlifting and powerlifting competitions. By 20, he was already the youngest person to win the Mr. Universe title. He moved to America when he was 21 with $21,000 in his account, and in fact, that was a huge amount 1968, which he earned from competitions. He invested much of his savings in real estate business and made considerable profile from each sales. By the time he was 25, Arnold was a millionaire, well before his career in Hollywood. After venturing into his other areas of interest, he started making millions out of it. He owns a massive 14,500 square-foot mansion in Mandeville Canyon in Brentwood. This sprawling masnion is now valued at $23 million that comprises of 7 bedrooms and 10 bathrooms. He has a large collection of automobile including 1940 Harley Davidson Indian Chief Model 1200 cc, Dodge Challenger SRT8, Custom Excalibur, Green and Yellow Hummer H1, Tesla Roadster, Mercedes Unimog U1300, Porsche 991 (997) Turbo Cabriolet, Ferrari 360 Spider, Bentley Continental GTC, and Mercedes-Benz SLS AMG Roadster. In June 1997, Schwarzenegger spent $38 million of his own money on a private Gulfstream jet. Arnold started bodybuilding career at the age of 15 and won the Junior Mr. Europe contest in 1965. In 1967, at the age of 20 he became the youngest person to win the Mr. Universe title. He won Mr. Olympia title in 1970. He is considered one of the greatest bodybuilders of all times and went on to win Mr. Universe five times and Mr Olympia seven times during his career. Schwarzenegger served in the Austrian Army in 1965 to fulfill the one year of service required at the time of all 18-year-old Austrian males. Arnold had a strict upbringing where his parents used to beat him up with a rod whenever he did wrong. His father wanted Arnold to be a police officer like he himself was but his mother wanted him to go to a trade school. Reg Park, Johnny Weissmuller, and Steve Reeves were his bodybuilding idols. For several years, he wrote monthly column or the bodybuilding magazines Muscle & Fitness and Flex. In 2016, he replaced Donald Trump as host of The New Celebrity Apprentice (15th season) but after facing backlash he did not return for the next season. Schwarzenegger was a founding celebrity investor in the Planet Hollywood chain of international theme restaurants along with Bruce Willis, Sylvester Stallone and Demi Moore. Schwarzenegger’s autobiography “Total Recall: My Unbelievably True Life Story” was published in October 2012, in which he devotes one chapter called “The Secret” to his extramarital affair. He has been nominated many times as the Worst Actor in the Golden Raspberry Award. In 2004, he was awarded the Worst Razzie Loser of Our First 25 Years. He was conferred with the Muhammad Ali Humanitarian Award’ for his charitable endeavours. Arnold won his first ‘Golden Globe Award in 1977 for his role in the film Stay Hungry as New Male Star of the Year. He has been inducted into the Hollywood Walk of Fame and the WWE Hall of Fame. He gained the US citizenship in 1983. Arnold is a big fan of cigar smoking and WWE wrestling.